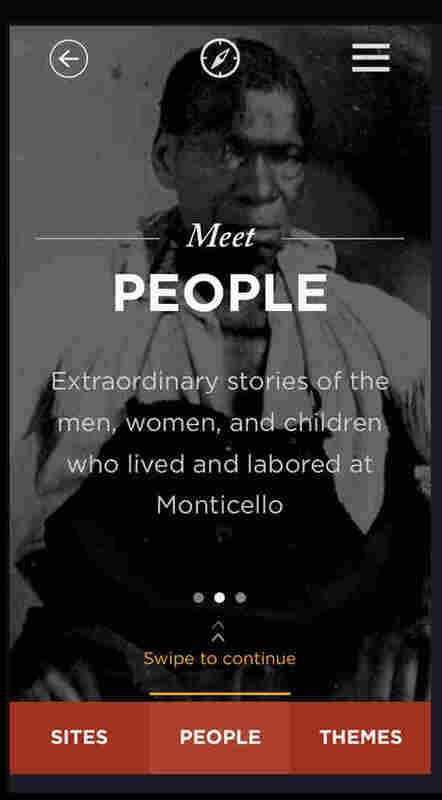 An App Tells Painful Stories Of Slaves At Monticello's Mulberry Row : All Tech Considered A new app uses geolocation to bring to life a lesser-known section of Thomas Jefferson's Virginia estate — Mulberry Row, which was the bustling enclave of skilled slaves who worked at Monticello. 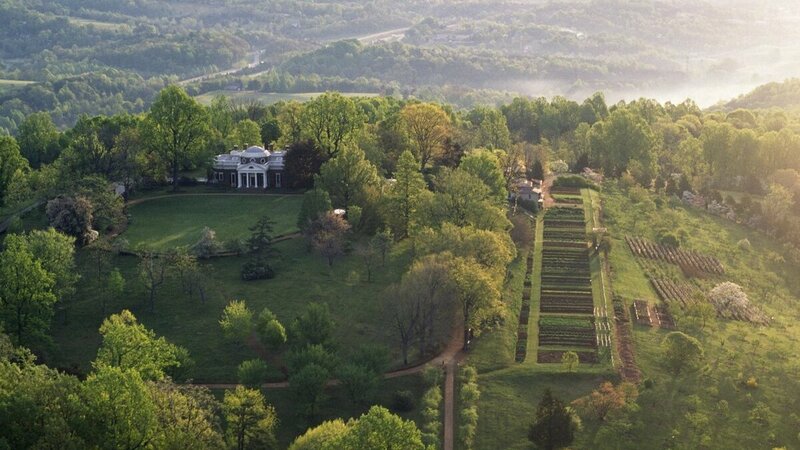 An aerial view of Monticello shows Mulberry Row to the right of Thomas Jefferson's house. Thomas Jefferson's vision of democracy has endured in one of the defining documents of U.S. history. But the 607 slaves who toiled in his Monticello estate have left few traces to remember them by. "To understand Thomas Jefferson, you have to understand the history of slavery at Monticello as well," said Stephen Light, the manager of house tours at the site of Jefferson's former Virginia home. But "the buildings that were meant to house enslaved individuals were made quickly and cheaply and they were not meant to survive," Light added. In order to bring to life a once-bustling enclave of skilled slaves called Mulberry Row, the museum has launched a mobile app — called Slavery at Monticello — that helps visitors visualize the space, stretching along a 1,000-foot path to the south side of the presidential villa in Charlottesville, Va. The geolocated app, which is free, allows visitors to explore the history of the patch of ground they are standing on. "If you let yourself imagine," said Chad Wollerton, director of digital media and strategy at Monticello, "it will bring you very close to people who used to work there." In more than 100 pieces of content, categorized by site, theme or person, the digital exhibition reveals the painful moral contradictions of the era, played out in Jefferson's own home. At the stable house, one of the few Mulberry Row structures that have withstood the test of time, users can hear about Jefferson's fit of anger when a slave called Jupiter Evans refused to send a thoroughbred horse on an errand. Evans had grown up alongside Jefferson and served him all his life. When Evans died, the Founding Father deplored that his loss "caused a real gap in his household management." Those interested in the personal stories of the Monticello slaves will learn about the Hemings dynasty, whose matriarch Sally was Jefferson's concubine and is believed to have had six of his children. All 10 slaves Jefferson freed were Hemings family members. By exploring broader themes of the slaves' lives, users might find runaway James Hubbard's story, a heart-wrenching tale of perseverance and punishment. After a carefully planned escape, Hubbard was arrested at Fairfax County, just across the river from Washington, where he could have passed as a free man. Yet despite decades of archaeological digs and an oral history project that has gathered interviews with more than 100 descendants, many of these powerful stories have yet to find a physical home. Monticello offers slavery-themed tours and has placed its historical findings online. There's also an outdoor exhibition featuring historical structures, documents and artifacts along Mulberry Row. Publicly accessible information has allowed descendants, like Bill Webb, to retrace their lineage. Webb, 73, is the third great-grandson of a Monticello nailmaker called Brown Colbert who died soon after immigrating to Liberia, leaving three of his children behind in a quest for freedom. Webb, who lives in New York City with his wife, narrated the introduction of the app and many of its historical anecdotes. A self-described history buff, he has visited Monticello on several occasions since discovering his affiliation with the site. "Many people isolate their information. I believe it's to be shared, even if it's painful information," said Webb. "It's a fact and reality of American life." With a $10 million grant from philanthropist David M. Rubenstein, the Thomas Jefferson Foundation now hopes to resuscitate parts of Mulberry Row for a broader project to restore Monticello to its original aspect. 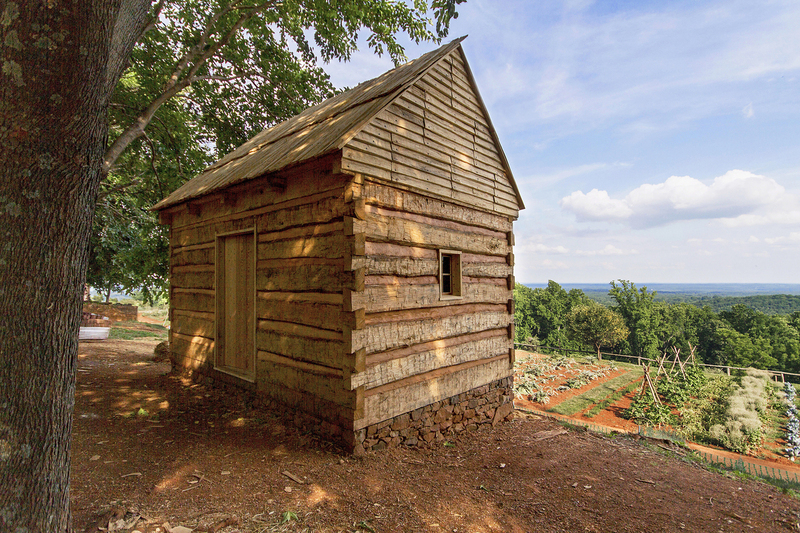 A reconstructed storehouse is among the sites along Mulberry Row featured in the Slavery at Monticello app. At various times it served as a workshop, tin shop and slave dwelling. In a May ceremony, the foundation unveiled a historical interpretation of the Hemings family's cabin and a reconstructed iron storehouse, along with the app. By serving as a digital exhibition, the new platform also allows past and future visitors to learn about Mulberry Row in their own time — which can make their experience on site richer. "The more you know about a place, the more you know about a subject, the more interesting it's going to become to you," said Wollerton, the digital media director. For wanderers, the app's iBeacon feature offers an added layer of historical precision without the rigidity of an exhibition space. The technology presented a particular challenge to Bluecadet Interactive, the design firm that made the app, which has now been downloaded more than 7,500 times. The Philadelphia-based firm has worked on more complex interactive platforms than the app's WordPress design. Last year, it created a digital copy of an 18th-century Korean document that visitors could leaf through for a temporary Philadelphia Museum of Art exhibition. Bluecadet has also designed an app and website for the Museum of Modern Art and been commissioned to help redesign the main hall of the Smithsonian's National Air and Space Museum. But the Slavery at Monticello app was the firm's first iBeacon project, and the physical setting presented its own set of challenges. Signals were too dispersed outside, so each site had to be fixed with several beacons. Additionally, "we had to fine-tune the range of those beacons so that they weren't crisscrossing," said Troy Lachance, the executive creative director at Bluecadet who oversaw the app's design. And because there were no walls, the firm ended up "strapping them onto tree limbs and other kinds of unconventional spaces," he added. Jenny Martin, 40, an author and librarian from Lewisville, Texas, gave the app a try during a visit with her family last month. While her teenage son roamed about, she used the application to read up on "stories and different tidbits," she said. She didn't mind receiving pings on her phone as she approached the beacon-marked sites; she could easily ignore them. But Martin enjoyed the freedom of movement afforded by the app. "Things in a museum tend to be laid out in a certain way and there's one experience," she said. "I'm a little bit rebellious, and I just à la carte looked at things as we moved from site to site." The historical information helped shed the former president in a harsher, but truer light, she added: "He wrote about freedom but he definitely left it to future generations to realize it." An earlier version of this post said there is no permanent exhibition dedicated solely to slavery on the plantation. Monticello has an outdoor exhibit featuring historical structures, documents and artifacts along Mulberry Row.